My husband had a horribly unfortunate short return home between recent business trips. I offered to make the unpack and quickly repack a bit easier and picked up a few things on his needed toiletry list. 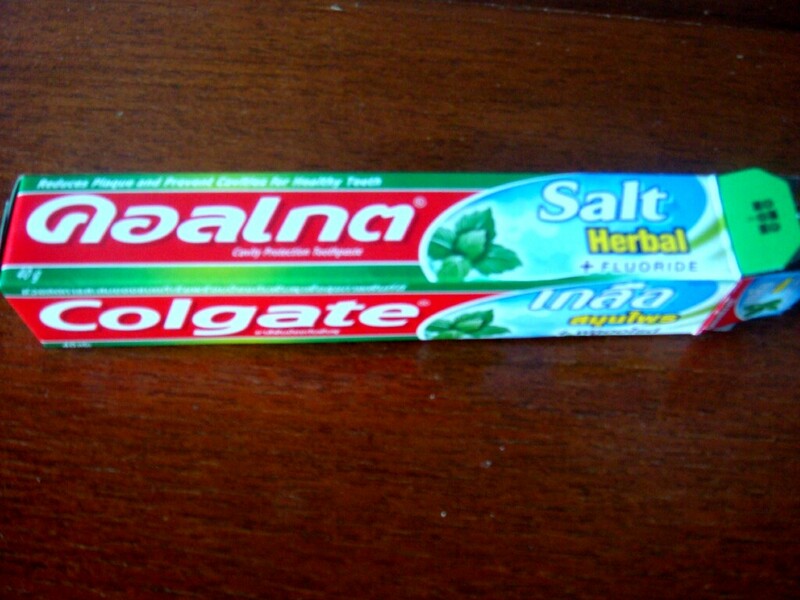 Looking for a tiny, airline friendly tube of toothpaste, I grabbed a familiar brand. Once home, the fact that I bought Salt(!!!!!) flavored toothpaste sunk in. Wiring. In the States, the entire perimeter of this intersection would be roped off for fear of electrical damage to anyone passing by. 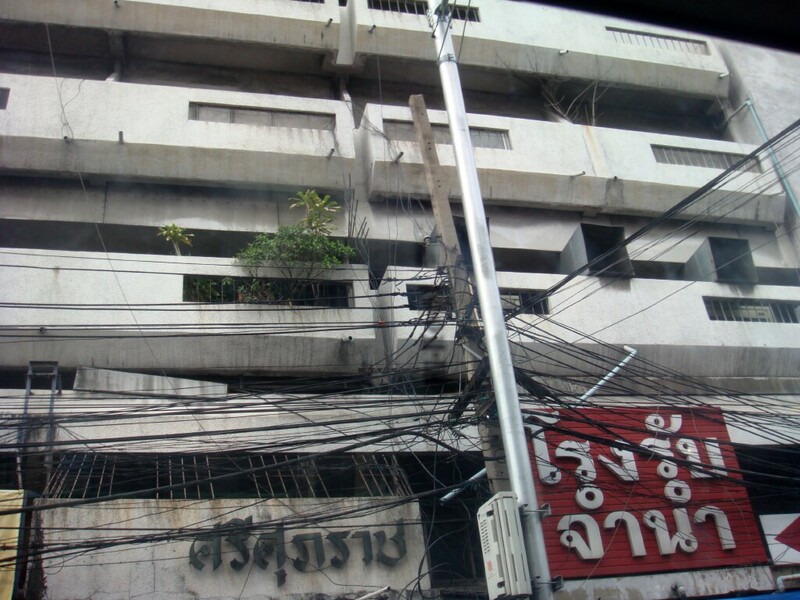 In Bangkok, every single sidewalk seems to be covered with poles dangling in intricate webs of electrical wire and hanging individual pieces trailing from the poles to the sidewalks. Crowds walk by and slowly move around all obstacles. I somehow can't seem to miss the swinging strays and they hit me in the windshield weekly while driving some of the side streets. 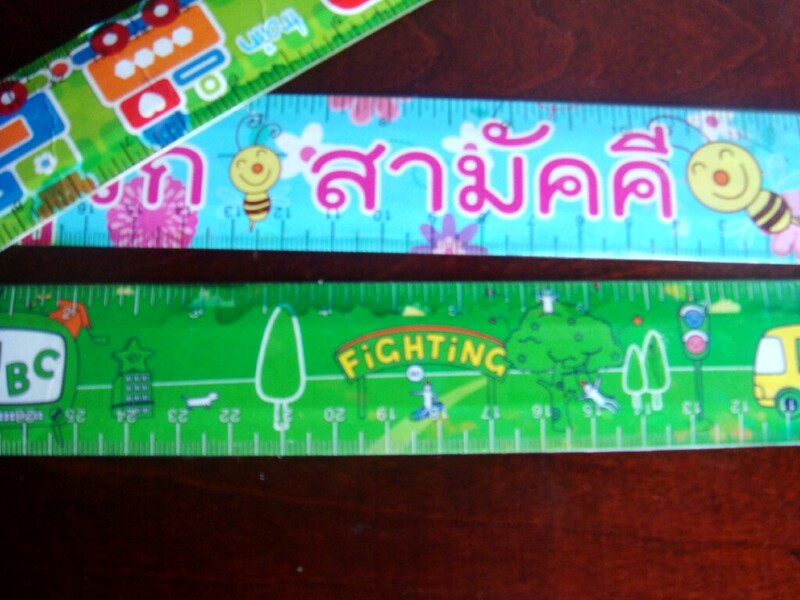 I have no idea what the Thai says, but found this adorable collection of children's school rulers while shopping an outdoor market. After a bit of use, I looked down and wondered why the entrance to the park (on the bottom green ruler) says "Fighting"?! 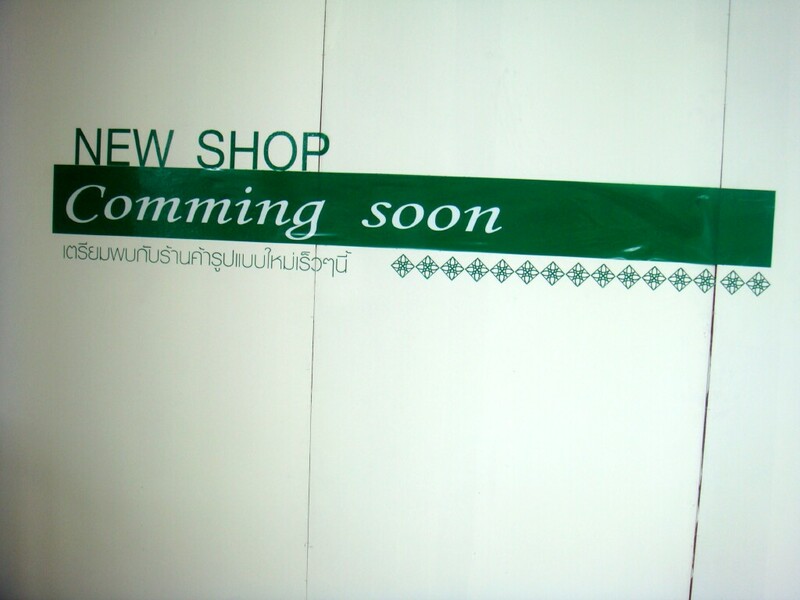 All over Thailand, English is used in the shopping and tourist areas. Writing of English seems to be approached similarly to a foreigner wishing to write a Thai word... sound out the words and give it your best shot. Other examples recently spotted on professionally printed signs: 'We toil your suit' (We tailor your suit!) and 'Come eet hair' (Come eat here!). 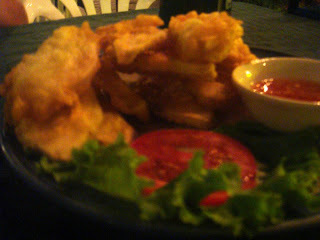 Deep fried jackfruit! Who would have thought to fry it (not me!)?! Found on a very local restaurant's menu, it was delicious. Kind of like a plantain, but not. Kind of like a fritter, but not. Crispy on the outside, creamy on the inside. Slightly sweet, but savory. I'm pretty certain I'll never have anything like it again. But, if presented with the opportunity, I'm soooo there. 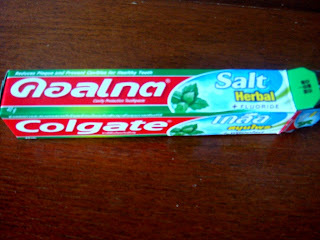 I bet your husband was thrilled with that salt flavored toothpaste! :) It's interesting the different flavors that other cultures put together. Some are great, but some are just too unfamiliar for me. 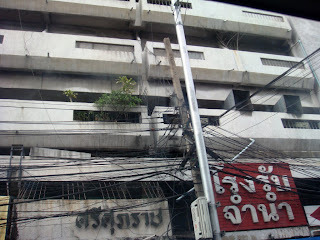 I am going to miss your insightful posts of Bangkok/Thailand. I hope you have as good a experience in your new destination as you have in Bangkok! Thank you for all your knowledge shared. It made my life so much easier! @Hanlie: Of course! 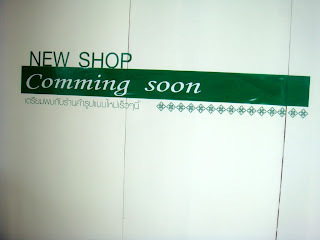 I'm so thrilled that you are seeming to enjoy Bangkok! And, I'm looking forward to staying in touch.